This page provides student flight experiment teams a log on the activities conducted with the SSEP payload during SSEP Mission 1 to the International Space Station from the time the students hand over their mini-laboratories before the flight to the point when they’ll receive the devices back after the flight. While the page will feature progress reports on the status of the SSEP payload in general, its main purpose is to provide updates on the handling of the mini-laboratories in orbit to the flight experiment teams as quickly as possible. The teams are advised to bookmark this page and check it for updates during the mission. SSEPM1-03: How Does Parathyroid Hormone Affect Changes in Bone Mass in Microgravity? SSEPM1-13: Will Vitamin C Preserve Bone Density in Microgravity? NCESSE notified all student flight experiment teams that all 15 Mission 1 flight experiments have passed formal NASA flight safety review. NASA Toxicology at Johnson Space Center informed NanoRacks there were no safety concerns with the experiments, and so the integration of experiments into Aquarius—the Mission 1 to ISS payload—can proceed. See this SSEP national blog post for more information. NCESSE provided Final Experiment Details Confirmation Forms for all 15 Mission 1 flight experiments to NanoRacks. All experiment details are now considered final, except for the experiment timelines aboard the ISS. The timelines need to be re-assessed once the exact date for the arrival of the payload to the ISS, the overall ISS crew schedule, and the exact date for the departure of the payload from the ISS are known. NanoRacks informed NCESSE that all mini-laboratories have arrived in Houston. All but one had arrived by the evening of April 6 (see this SSEP national blog post for details), but now all mini-laboratories are ready to be incorporated into the SSEP Mission 1 payload. Payload integration is expected to be completed by Wednesday, April 11. The SpaceX Falcon 9 rocket carrying the Dragon spacecraft was launched at 3:44 a.m. EDT from the Cape Canaveral Air Force Station in Florida, carrying the Aquarius, the SSEP payload, toward the International Space Station. The launch had been delayed a couple of times from the originally planned April 30 date, but since Aquarius was kept safe and secure in its refrigerated cold bag since payload integration, the delay is not expected to have adversely affected the experiments. The ISS crew completed the berthing operations for SpaceX Dragon spacecraft, marking the historic milestone of the first commercial spacecraft to have arrived at the International Space Station! Following a series of tests over the past two days, the Dragon spacecraft approached the station this morning, was grappled by NASA astronaut Don Pettit using the station’s robotic arm at 9:56 am EDT, installed to the bottom of the station’s Harmony node at 11:52 am by the European Space Agency astronaut Andre Kuipers, and bolted to Harmony by NASA astronaut Joe Acaba at 12:02 p.m., completing the berthing operations. The Dragon has arrived! The hatch between the Dragon spacecraft and and the International Space Station was opened at 5:53 EDT on May 26, 2012. This marks the first time a commercial spacecraft has completed docking to the ISS. The astronauts will transfer cargo carried by Dragon, including the SSEP payload, to the International Space Station. The first experiments in the SSEP payload, Aquarius, are expected to be started on Monday, May 28. 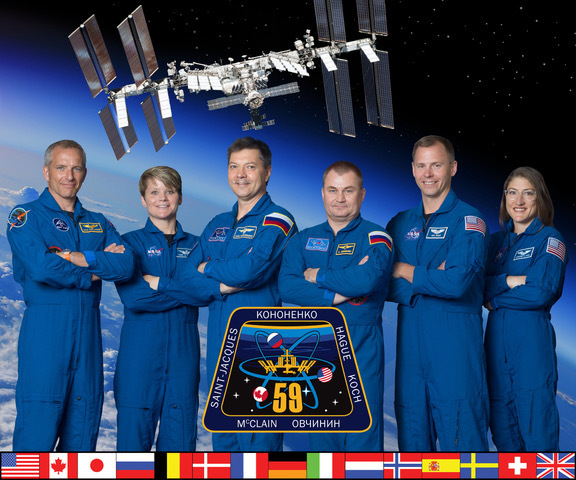 NOTE: The times for operations aboard the International Space Station will be given in terms of Greenwich Mean Time (GMT), which is the time followed by the crew aboard the ISS. The time difference between GMT and Eastern Daylight Saving Time (EDT) in the U.S. is 4 hours. For more information on Greenwich Mean Time, and time zones in general, see the NASA Eclipse Web Site page on Time Zones and Universal Time. See this SSEP national blog post for more details. The other experiments are not affected by this event. See this SSEP national blog post for more details. The experiment will remain active through the end of the mission. After the completion of the last scheduled activity with SSEP experiments for this flight, the crew stowed the SSEP payload in Soyuz 29, which will bring the payload back to Earth on July 1, 2012. Soyuz 29 undocked from the International Space Station at 4:47 GMT (12:47 am EDT), and landed at Kazakhstan at 8:14 GMT (4:14 am EDT). The landing of the spacecraft marked the end of the flight for the SSEP Mission 1 payload, which is now en route to Houston for processing. The landing also marked the end of the ISS Expedition 31 mission, which consisted of Russian Commander Oleg Kononenko, NASA Flight Engineer Don Pettit and European Space Agency Flight Engineer Andre Kuipers. ISS is now staffed with the Expedition 32 crew, which includes Russian Commander Gennady Padalka, as well as NASA astronaut Joe Acaba and Russian cosmonaut Sergei Revin. NanoRacks received the payload from NASA. Because of the Fourth of July holiday the following day, NanoRacks will keep the experiment devices in a controlled temperature environment (either refrigeration at about 4ºC; 39ºF, or at room temperature at 21-24ºC; 70-74ºF, depending on the special handling requirements specified by the teams) in their payload processing facility over the holiday and ship the packages containing the experiment devices to the student teams on Thursday, July 5, 2012. NanoRacks shipped packages containing the experiment devices to all teams for whom they had the required FedEx airbills available by the shipping deadline. Those packages for which the airbills were not available by the deadline, or those packages that were not using FedEx, will be shipped as soon as possible, most likely on Friday, July 6. The packages will reach the teams starting on Friday, July 6, depending on the delivery speed chosen by the teams. Good luck to all student teams with the analysis of their experiment results!